The district of Sfakia, with its main village Chora Sfakion, is a very special part of Crete, far away from the mass tourism of the north coast. It is located at the lybian sea in the southwest part of the island and is shaped by the fantastic mountain range called “White Mountains”, dominated by Pachnes (2453), the second highest mountain in crete. The rough and dramatic landscape of this area is softened by olive trees, tamarisk and pine trees and the gentle sound of sheep and goats bells. The region is famous for its independent spirit and was the center of resistance against the Venetians and the Turks. Chora Sfakion (commonly called Sfakia) is a characteristic traditional village of about 300 inhabitants, where locals outnumber tourists. Shepherds can still be seen in local dress and many of the older houses in the area are of traditional architectural style with large stone arches. Sfakia offers a variety of facilities: cafes, restaurants, mini markets, a bakery, a post office, taxi and taxi boat services and a car rental office. You will not find a bank but two cash machines although some businesses accept credit cards. There is a medic for emergencies although the nearest hospital is in Chania. 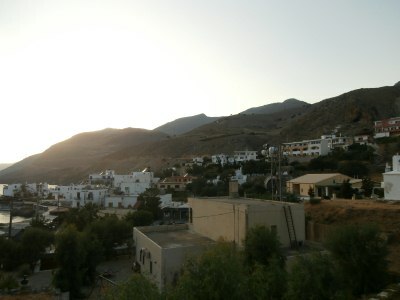 Sfakia is readily accessible from the north coast of Crete by car and public transportation. Chora Sfakion is perfectly situated for day trips into the nearby mountains or along the coast by boat. A wonderful selection of long and short hikes starts from the village along old shepherds’ paths and through the many nearby gorges. Spring and autumn are ideal periods for the above activities.